Colonel Saw Shi Tat said cultivating the “family spirit” within the team was something that was planned months before their deployment. As part of their preparation before being deployed to Bahrain earlier this year to command a multinational counter-piracy task force, the Singapore Armed Forces (SAF) team members did dragon-boating and had barbecue dinners together. These were to build up the camaraderie among the 53 personnel, who included regulars, operationally ready national servicemen (NSmen) and women volunteers, for the three-month mission to combat piracy in the Gulf of Aden, said Colonel Saw Shi Tat, 43, who led Command Task Force 151 (CTF 151). The effort paid off during a large-scale nine-day operation in September, when team members did not mind putting in the extra hours over two weekends and they went "over and beyond" what they were expected to do, he added. The SAF completed its command and handed over to the Kuwait Naval Force on Sept 27, with zero piracy attacks in the Gulf of Aden in the three months it was in charge. In recognition of their efforts, Overseas Service Medals were awarded to the team by Defence Minister Ng Eng Hen in a ceremony at the Ministry of Defence (Mindef) yesterday. Another 45 medals were given to personnel who contributed to the multinational coalition efforts to defeat the Islamic State in Iraq and Syria (ISIS), including the deployment of the Republic of Singapore Air Force's KC-135R tanker aircraft. Working with other navies and international coalition forces is part of the job that I always looked forward to, so I was glad for the opportunity. MILITARY EXPERT 3 SIVALINGAM PALANISWAMY (above), 47, about the deployment to Bahrain. Dr Ng said Singapore remains committed to supporting the anti-ISIS coalition as it transits to the next phase to help stabilise the affected countries. He added that vigilance has been stepped up at home "in anticipation of the many terrorists who will return to this region". He said the SAF is also paying close attention to piracy, as 70 per cent of the world's maritime trade flows through the Singapore Strait. "Any major terrorist incident out at sea can impact Singapore severely as more than 90 per cent of our trade is seaborne. And for our maritime trade and industry to prosper, our sea lines of communication must remain open and secure." Dr Ng said the number of piracy attacks in the Gulf of Aden region has dropped from its peak of more than 200 in 2011 to zero successful attacks so far this year. Col Saw said that cultivating the "family spirit" within the team was something that was planned months before the deployment began. He added: "Our belief is that if the team functions as a family abroad, then we can have a good atmosphere of trust and mutual accountability, which are important in dealing with unexpected situations and developments." Since the SAF's first contribution to CTF 151 in 2009, it has deployed more than 1,400 personnel, five command teams, five task groups and one detachment of an F-50 maritime patrol aircraft. Dr Ng said the SAF's deployment overseas helps to keep Singapore and Singaporeans safe and secure. "In relative terms, our SAF, though it is a very good military, is not a large military. Even though we are small, we must do our part as part of the global effort to protect our region and our world from those who would use violence to force their way of life onto peace-loving and law-abiding civilians. "Whether they are pirates or terrorists, their methods target the innocent and destroy stable communities and societies." 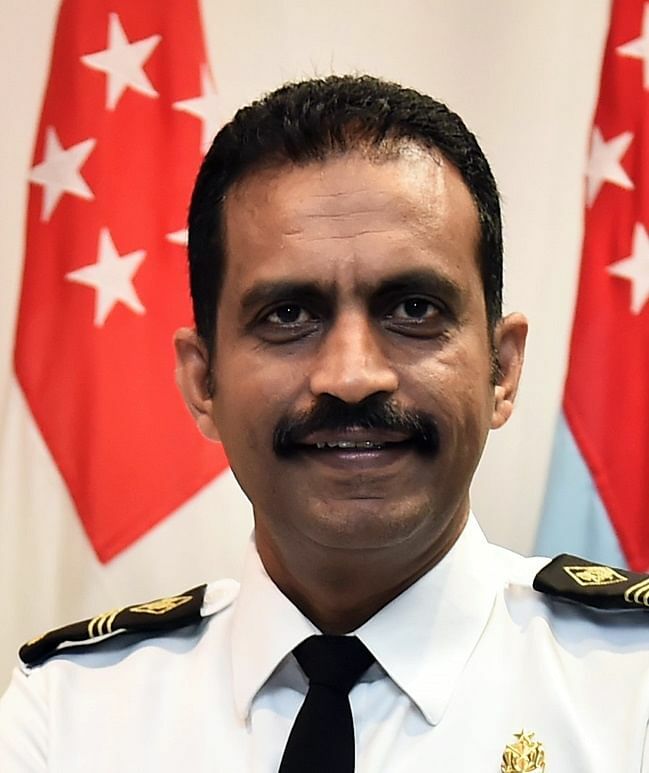 Military Expert 3 Sivalingam Palaniswamy, 47, an intelligence military expert who has been with the navy for 28 years, said the deployment to Bahrain gave him job satisfaction. "Working with other navies and international coalition forces is part of the job that I always looked forward to, so I was glad for the opportunity."